No crazy theme this week, just some graphic novels that I think you should know about! Today, my 8th period finished an essay as I sat in my comfy chair, classroom stage left, with tears streaming down my face as I was on my way to finishing Nicole J. Georges’ Fetch. 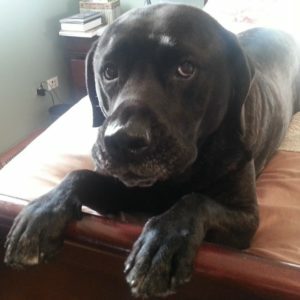 Over the last two days, I took my time through Fetch, and while I finished the book about five hours ago, I’ve teared up about three times thinking about it, two of those times while sitting on the floor with my own pup. 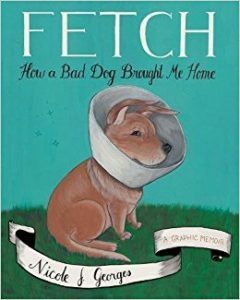 Fetch is an amazing graphic memoir by author/artist Nicole J. Georges on her journey to discover herself with an imperfect pup named Beija by her side. This is the type of book that makes me question why I ever read hero comics. The reality, the honesty, the rawness of the tale took me to places that I questioned, loved, remembered, and most importantly, related to. There are many things right with this book, but first and foremost is Georges’ honesty and vulnerability. And it is this honesty that allows us to take the journey with her. Over 300 pages, this is no thirty-minute read. You will spend time with Nicole and Beija. You will feel their pain, successes, love, and hope. Black and white as to not distract from the story (check out yesterday’s post to read about my students’ feelings about B&W graphic novels here), the art is simple with more detailed panels/pages to add emphasis. But the pacing of the book is where the craft hits its stride for me as far as the construction of the story. This book is perfectly paced. It took Georges 300 pages, but that’s what it needed. If this book were shorter, I don’t know if I would have had the reaction that I did. If it were longer, I might have been asking where it could have been cut down. maybe it’s because like Nicole, I’ve suffered with the discovery of self with smatterings of loss along the way. Whatever it is…I love Fetch. I finished it today, and I can safely say that it is in the top five books that I have reviewed thus far out of the over 90 that have already been reviewed. I’m on a quest this coming weekend to find many more books like Fetch. Nicole, if you read this, thank you for allowing me to take that journey with you. I hope you can send me some great graphic novel reading recommendations, and as my non-profit begins planning our educational comics programming submissions for Emerald City Comic Con, I hope we can convince you to join us for a non-fiction comics panel. We’d be honored, and you are no doubt an expert on the subject!